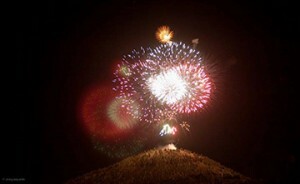 The fireworks on Pilot Butte! Spark Your Heart 5k Run/Walk: Start your morning off with a bang at the Spark Your Heart run/walk benefiting St. Charles adult cardiac rehab and wellness programs and children’s cardiovascular programs. Events include a Children’s Heart Fund Dash for kids 8 and younger, a 5K race, and a 1K for cardiac rehab patients. It begins at 7:30am at Riverbend Park in the Old Mill! Pancake Breakfast: Treat yourself after the run with the annual Pancake Breakfast, a popular Bend tradition sponsored by the Bend Sunrise Lion’s Club. The all-American meal is served from 8am to noon at Drake Park. It costs $6 for adults and $4 for kids, and proceeds go to local charities. Pet Parade: A local favorite since the 1930s, the Pet Parade is traditionally Bend’s largest parade, with 8,000 spectators and participants, including humans, canines, farm animals, iguanas, hamsters – you name it – all dressed in red, white, and blue. The meandering menagerie hits the streets of downtown Bend at 10:00 am. If you want to participate, the lineup and decorating party takes place at 9:30 am in the parking lot across from the Deschutes Public Library. If you prefer to spectate, get there early. Parking can be hard to find. Old Fashioned July 4th Festival: After the parade, head over to Drake Park from 11-4 for games, live music, food, children’s activities, and more than 130 artisan booths. Fireworks: End an awesomely American day with a fireworks show! They’re launched from on top of Pilot Butte at 10:00 pm. Bring your blanket, chairs, and craft brew of choice to virtually any spot in Bend that has a view of the butte and you’ll be set.